Delaware Technical Community College is upgrading your workstation technology this summer. 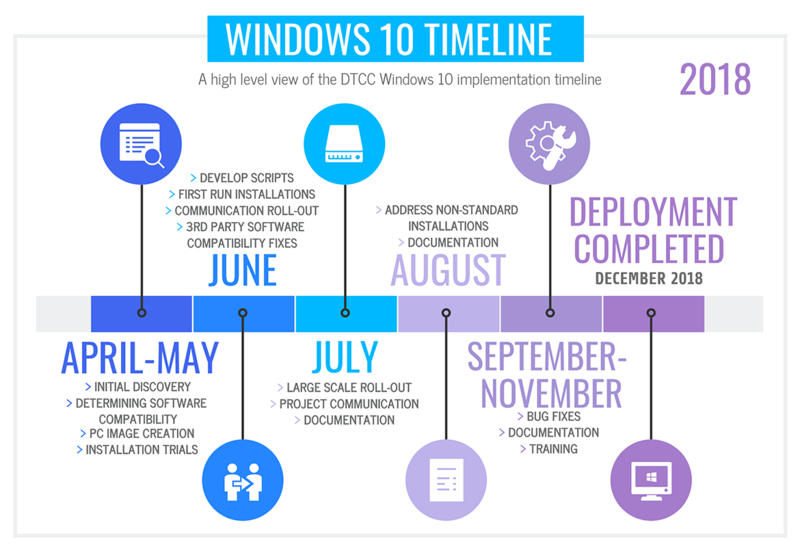 Your workstations will be upgraded from Windows 7 to Windows 10 operating systems. There are so many features you will enjoy in this new environment. Read below about the great change coming your way! Save time and effort with Cortana, your virtual personal assistant. Organize, annotate, continue browsing from PC to phone to tablets – Microsoft Edge is the faster, safer way to get things done on the web. Now you can go back in time and pick up where you left off. Focus assist gives you the flexibility to choose when to block interruptions. Turn on Focus assist whenever you want to get things done without distractions, like notifications, sounds, and alerts. Or set Focus Assist to turn on automatically at certain times during the day. The deployments are occurring in stages to ensure a smooth deployment. Each group/department will be notified of the schedule for their respective areas prior to implementation. If you are interested in volunteering to get Windows 10 now, please contact your help desk. Windows 10 works very similarly to your current operating system, Windows 7. There is a link on this page with training guides to help you get the most of your new software. Employees can also attend upcoming lunch and learns with CCIT. Will software that works on Windows 7 work on Windows 10? Software and hardware compatible with Windows 7 are mostly compatible with Windows 10. IIT is currently testing software used in the classrooms to ensure each is compatible. For inquiries on a specific software, please contact the Help Desk. Will all of my files be moved automatically to the new operating system? Yes, your files actually reside on our fileshare server and will not be affected by this operating system upgrade. Will my browsers be the same? Yes, you will still have the same browser options you had previously except you will have Microsoft Edge, which is faster than Internet Explorer. You will not see a CTRL+ALT+DEL window in Windows 10. Press any keyboard key to be presented with a login window. Click the Windows button in the bottom left corner, click the user button (fifth icon above the Windows button may be your personalized picture, may be a generic icon) and then click logoff. How do I find ‘My Computer’? Click the Start button (normally in the lower left corner), goto “Windows System”, there you will find shortcuts for “This PC” and “File Explorer”. You can right-click on the shortcut and select “Pin to Start Menu” to have it added to the right side of the Start Menu.